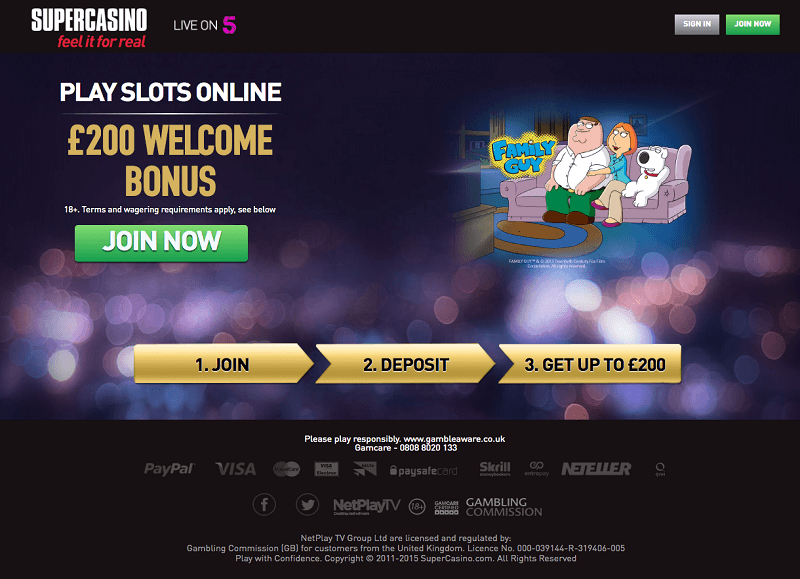 Super Casino is run by NetPlay TV Group Limited in Alderney and has received recognition to be among the most reputable online gaming destinations. This casino was launched in 2005 as Vegas 247 and has undergone multiple changes in branding to be what it is today. This Super Casino review looks deep into the features of the casino and some of the benefits that have been recommended. Persons under the age of eighteen are restricted from becoming members of this casino or participating in any activities relating to the establishment. Gamers need to pledge that funds used in the casino are attained through legal means. If players personal and financial information changes, the player must inform Super Casino promptly. Services provided by Super Casino are for entertainment purposes only. The use of the provided products for commercial purposes is prohibited. When accessing promotional rewards and any other services, terms and conditions apply, and they must be adhered to entirely to prevent loss of funds or membership to the casino. Before agreeing to the rules set by the management, it is essential that gamers read through the set terms keenly before engaging in any form of contact with the casino. Super Casino online has two software providers that supply games to the website as well as the television channel Playtech and NetPlay TV. The two providers are among reputable software developers in the industry. Despite the small number of software providers, Super Casino online has a rich collection of games discussed below. Slot games have amassed popularity in the realm of online gaming. The growth is attributed to some factors such as smooth gameplay for most of them, lucrative bonus features, and the affordable minimum stake limits. Slots are available under the Vegas option on the Super Casino site, and some of those featured under the popular list includes Golden Egypt, Ocean Magic, Macedonia, Treasure Island, and Hot Sync. Most of the slot games found on the website are in high definition and have been reviewed as among those that provide captivating themes and gameplay. There is a good number of table games for players. Standard versions of table games such as Baccarat, Blackjack, Poker, and Roulette are available. Also, they combined with different rile and layout variations of each to fill this category. 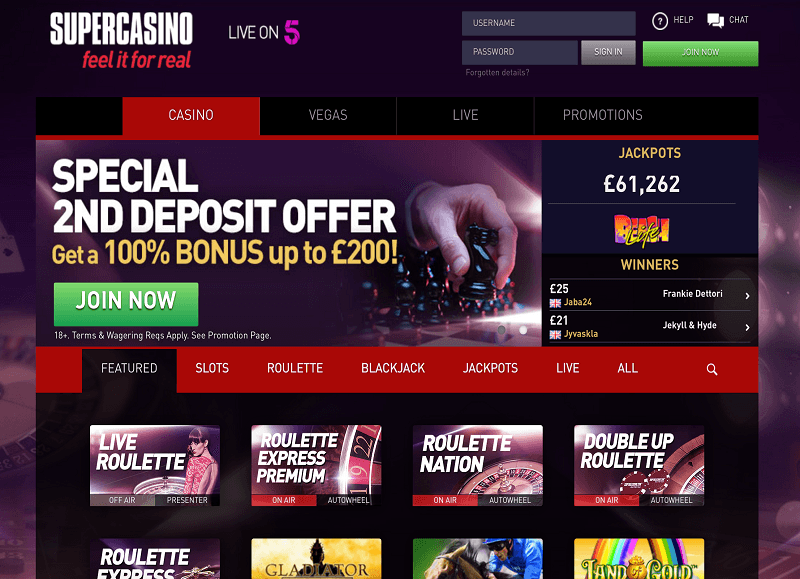 Live gaming sets from Super Casino are available on the website and also aired live on the Super Casino TV station. 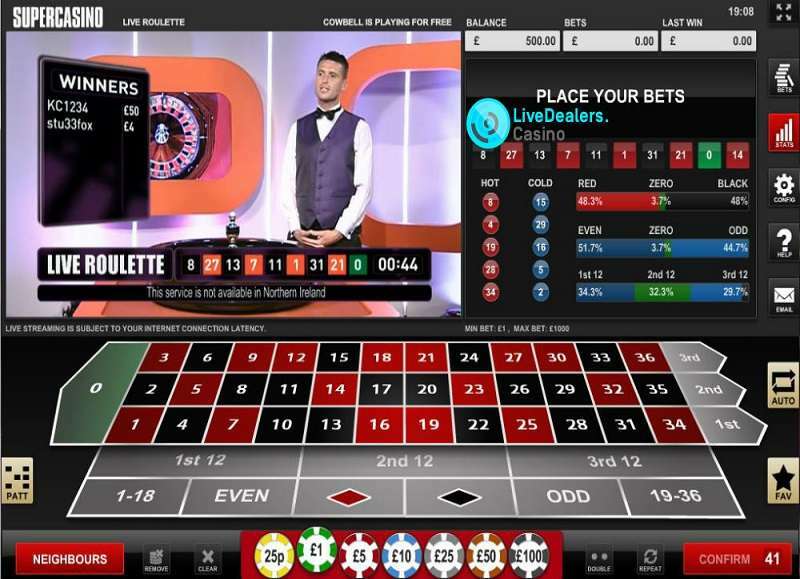 Some of the games that are broadcasted live include Roulette Express, Roulette Nation, Double-up Roulette, Roulette Express Premium, etc. The television show entertains gamers and non-players as well. The growth of Super Casino has been attributed to the enormous success of the TV show. The premium received must be staked 25 times within 30 days before the player can withdraw any funds. Deposits made using Neteller, Skrill, or Paysafecard will not qualify for the bonus. Players should consider using other deposit options provided if they want to receive the bonus. Players should check the list of games excluded from this bonus since not all of them contribute to the wagering requirements presented. Withdrawal of funds is acceptable before wagering requirements have been met, but only for the initial deposit and wins accrued through it. However, in doing so, players will have to forfeit the bonus and any wins gained from the reward. Gamers who are not eligible for the bonus but wish to be accorded are advised to take it up with customer service. Participating players for this reward must be over eighteen years and residents of the UK. Players can only claim the bonus once. The deposit must be the first ever made by the client. History of prior deposits disqualifies a player. Free spins awarded along with the matched deposit can only be used in Jungle Giants. Awarded free spins must be wagered 35 times before the permitted period of use, which is seven days. If the seven days elapses without players meeting the staking requirements, they lose the remaining spins as well as money acquired through them. Super Casino runs tournaments on a regular basis. The competition awards players various gambling prizes. The promotions run within specific times and accompany some of the latest releases in the overall gaming scene. The tournament campaigns are conducted on the website and across multiple social media platforms that boast of a massive number of users. Players should adhere to the set regulations to ensure they cash in on their deposit as well as the bonus they receive. Credit or Debit cards. These cards are available from different providers who come from the list of highly recommended firms in the finance industry. Opportunities open for members of Super Casino include MasterCard, Visa, Maestro, Visa Electron, and Delta among other listed options. A minimum deposit of 10 pounds is allowed for the payment options given. The maximum deposit limit is 10,000 pounds, which can be deposited in installments. Gamers are advised to check with their credit or debit card providers to acquire information relating to any charges that may incur when crediting an online gambling establishment. EWallets. Super Casino offers gamers an opportunity to fund their accounts using digital wallet methods. Options available include Neteller, Skrill, Entropay, PayPal, and UKash among others. PayPal deposits are charged a three percent fee. It is eminent that gamers include the fee charged. Other methods are not charged for deposits. Voucher system. Vouchers are a reliable form of funding an online account. This method leaves no paper trail and allows players a high level of privacy when depositing to their online account. Voucher cards can be bought on the internet or from land-based dealer shops. Paysafecard is one of the voucher options listed on the website. No deposit charge is incurred when gamers use this method. A licensed firm meets the needs of virtual gamers adequately when fully regulated and controlled. 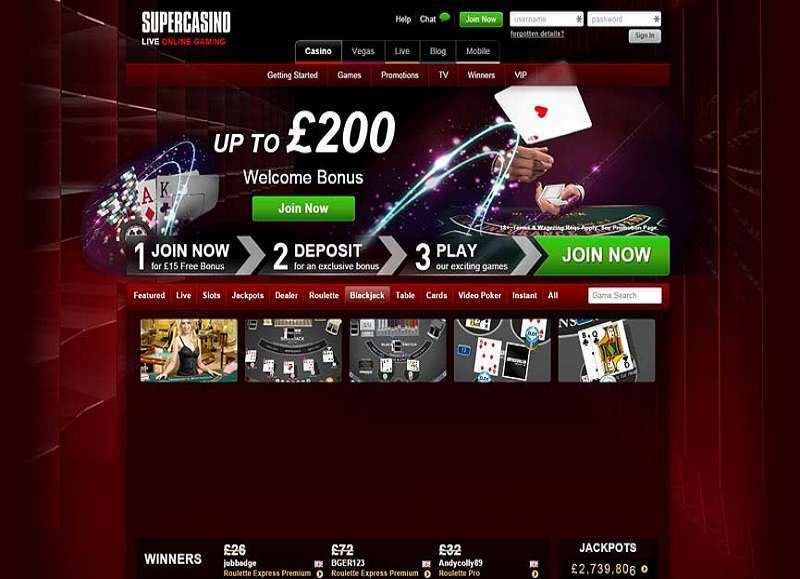 Super Casino is licensed by the UK Gambling Commission (UKGC) and is expected to adhere to set regulations. Code of practice established by the regulatory body is put in place to protect gamers from any fraudulent activities. Before issuing a license, a casino is audited thoroughly to ensure that they provide standardised games. Another area of interest for the control body is the finances of the entity. Player’s funds are to be deposited in a different account, and the establishment should have a business account to avoid mixing of the two types of funds. Super Casino goes through regular audits to confirm these policies are being followed. Second regulatory body licensing NetPlay TV Group is the Alderney Gambling Control Commission. Inspection is conducted by independent firms such as eCOGRA that are among the most trusted audit firms. Hence, fairness and player protection are assured. Super Casino is available in both download and no download versions for mobile and other convenient devices. Bets can be made directly via Super Casino app or players can choose to log into the internet and play games on the website. The application is compatible with Android devices and a decent number of another operating system. The provided application is suited for gamers on the move who want to gamble online. Players can access services configured for mobile and enjoy Super Casino play online at any time of the day. The customer support team at Super Casino is reachable twenty-four hours a day, seven days a week, all year round. they provide several contact options, including live chat, phone, and email. The live chat option is limited to desktop users. Players using other devices such as television, tablet, or mobile can use other options for any queries or concerns. An additional method that can be exploited by players to reach the customer care team is the use of postal mail. An address is provided on the website and gamers can send letters to the support team all year round. The customer care team at Super Casino has been reviewed to be among the best in the industry. Super Casino has gained fame over the years for being among the best go-to online gambling destinations. Coupled with a TV show, Super Casino is among gambling destinations that receive a massive flow of traffic. Some nations have strict gambling rules that prohibit the activity entirely in the country while in some Super Casino has restrictions in the jurisdiction. Players should countercheck restricted countries on the official website to know if they are permitted to play.